This article was originally posted on the Shambhala Times. 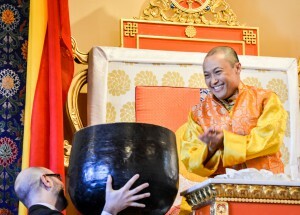 And, if you want to view the video of the address, or the other Shambhala Day videos, they are available here on Shambhala Online. Ladies and Gentlemen, please join me in a cheerful new-year bow. As we gather on this very primal day of the new year, please bring to mind your basic goodness, your aspiration for this year, with tenderness and strength. As we live life, let us connect at the heart level, and as we gather as a community, we can join our heart and mind in this moment with that. Good morning, everyone. [All: Good morning!] You are looking beautiful and radiant. I just came here to cheer you up. [Laughter] Looks like you are already cheerful. I would like to wish everyone joining us, as we gather in this moment, a very cheerful Shambhala Day. In particular, this year, I believe, is a very important new year. 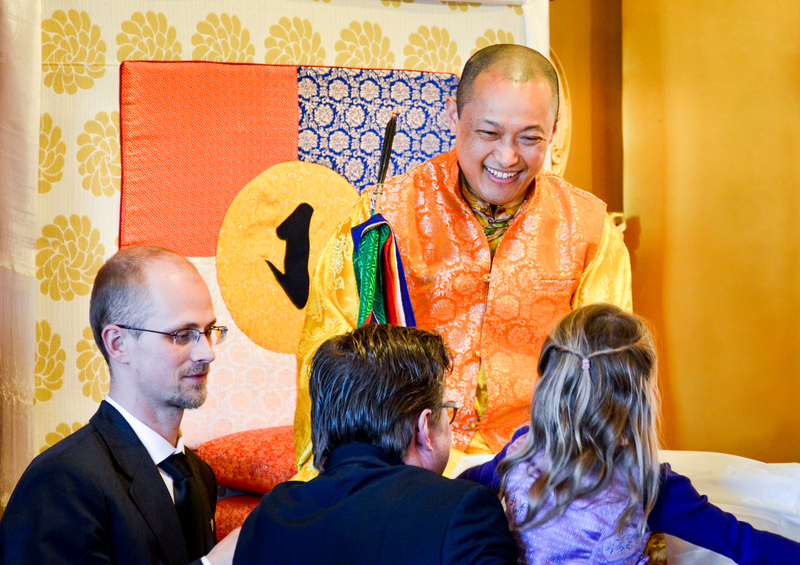 Every year, we gather as the Shambhala community on Shambhala Day, our new year. We also have our conventional new year—so we are not losing touch with reality [laughter]—and it is in the middle of the workweek, as some of you or your co-workers probably know. [Laughter] But we feel like this is an important moment, and I have been lobbied many times to change Shambhala Day to a weekend! [Laughs; laughter] Obviously this year it failed. So we are gathering on a Tuesday, but really we are gathering to mark our basic-goodness calendar. It is very important that what we are doing as the Shambhala community is creating a culture of basic goodness. The message of the principles of basic goodness, warriorship, and bravery are needed more now than ever. Every year, as the world goes forward, whether it is with fear or uncertainty, we are challenged by these events too, at a personal level and a global level. It is important for us that we connect on this day to something deep within. And I love you! [People in assembly: We love you too.] I can feel it! [Laughs; laughter] I have heard it before, but I can feel it this time. And I feel like—just to let everyone know—I am a human being. I love my job. [Laughter] That’s my big statement today. But as everybody knows, love is challenging, and the reason I do this is because of this love, which is the notion of heart. Today what we are really celebrating with this presence that I believe is next to me, covered, is the notion of lineage—not as antiquity, not of the past, but of the now. That lineage is in our heart. We are willing to actually chew on these very challenging principles and teachings of kindness, that each sentient being is fully awake, that we are willing to live our life by these principles, and that we are willing to form a community and try to communicate these principles. So lineage to me is that we are creating a fabric of community, of society. It is our biggest challenge, but also our biggest reward. Shambhala Day represents not just our meditation, which is excellent to do, but actually creating a fabric by which we can live daily. I believe we all experience lineage as we hear of great lineage figures, who have kept this flame alive. On any given day, it is very easy to be tempted to give up. I am always amazed that in terms of tradition, lineage is that somebody did not give up, and so far, in all the lineage stories I’ve read, everybody had a pretty tough time. Otherwise it would be a very short story, not interesting [laughter], as we know from the movies. Every person went through trial and tribulation, and obviously in my mind there are none greater than my father, the Vidyadhara, the Venerable Chögyam Trungpa Rinpoche, the Dorje Dradül, the Druk Sakyong. This is our heritage. So as we try to apply these principles daily, we are part of that lineage. We are sewing that fabric ourselves by not giving up, by remaining tough and tender. And so today it’s reawakening. You can go through every year and there is a tendency to just get by. Our thoughts come and go. In our modern society, they seem to be focused on sports [laughter & applause; the Denver Broncos had just won the Super Bowl], which is sometimes okay. 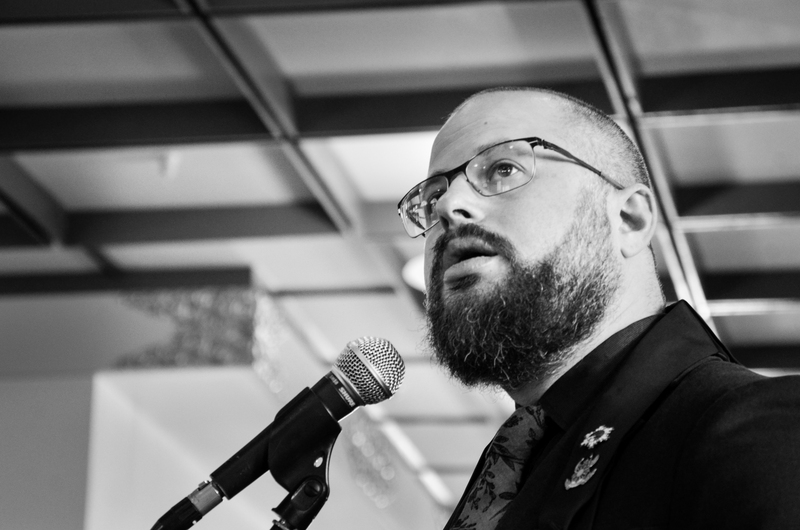 It is a sense of wanting to participate: seeing struggle, seeing somebody overcome. So I am inviting you and asking you to wake up today. Look at your life. It is your life. It’s not somebody else’s life. We may be living very close to somebody else, but it is our life. These calendar years are not just randomly made up. They are following the seasons. They are following the progress of time, and they are following the progress of our hair color. [Laughs; laughter] They are demarcations throughout our life. We are marking one today, and what we are marking is the continuity, the wakefulness that began in the ancient land of India and Tibet and the world wisdom cultures that we all enjoy and respect. We are trying to sew those wisdom fabrics into our life, into our modernity. We are challenged by speed and by often feeling disconnected. But at the same time, underneath there is the yearning that life is meaningful and powerful. This is what we are celebrating as a community. In this way, lineage is not a level we reach. It is something that we are creating through our own hard work, through our own determination. In this way, it is important for us to feel like every day we are participating and creating the fabric of our life through our own attention, and for us to do that. I would like to honor everyone’s practice. Whatever practice you are doing, that it is important for your own heart and mind. The practice of meditation is good for us, good for who we are. At the same time, I would like to encourage you to please work on your relationship and family, on how we work together, and most of all, how to incorporate that all into your daily life. This is all a fabric we can weave together. As Shambhala progresses, it is less and less a matter of our spiritually oriented self, our deeper self, and then our normal life. We can bring the whole thing together. If we do this as a community, we have not only endured, we will also continue. Ladies and gentlemen, even though it is a tradition of warriorship we are engaged in and working hard and enjoying the process—enjoying the fact that we have to put our energy into it, which makes us valiant individuals and is good for our character, our ziji, our presence—at the same time, we can delight and enjoy. So it’s okay if you must smile occasionally [laughter]. I mean I know that frowning is very tempting. But the gravity pulls you down and we have a very complicated logic as to why we have to smile. It goes up for a second, and then back down. Can we be in that situation and have some levity? When you do that, it’s not just for yourself. It’s amazing the power that that has. As a Shambhala community, can we do that for the world? Can we come together as a community and do that? I believe we can. I believe we will. 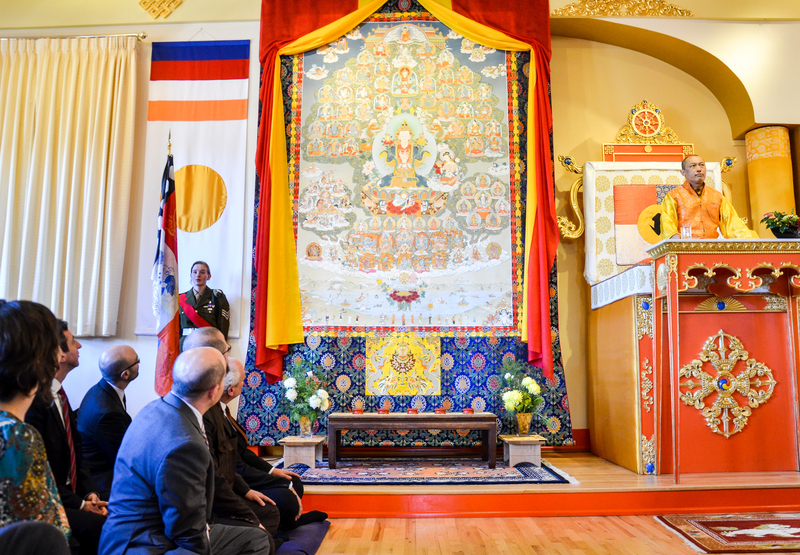 Today we are having a glorious, auspicious unveiling and opening of the Shambhala Lineage thangka, which is next to me. This thangka is a painting that represents this notion of lineage. This is important because it is the actual visual image of the continuity and heritage that we all have. For myself, personally, it is important because I have always been in a situation of bridging two worlds: the ancient world and the modern world; the Asian and the Western; the ancient practices of Tibet and India and our modern life. I have always walked the path of how to keep the continuity, authenticity, and genuineness of what has come before; how to make it not antiquated but relevant; and how it can go forward. So I think this thangka is a bridge. It is a gift. It is an opportunity for us to connect with that. I was thinking about what to express, and I would say that this thangka is about family. This is your family. Karmically, somehow whatever happened before has touched you, and we continue that forward. It’s the spirit, which will take us farther as we all live life. What is about to come will be influenced by how we manifest as ourselves. In this way, I hope the thangka not only blesses you, but inspires you and it encourages you to do good—to incorporate it personally and in the world. It is strength. This thangka has taken over ten years to paint. One of the greatest painters in Tibet and in Tibetan culture, Mr. Noedup Rongae comes from a lineage of thangka painters. His father was a master thangka painter who served my father and escaped from Tibet. Mr. Noedup Rongae has accompanied me and supported me, serving in many, many contexts., so ten years ago, when I asked him to paint the Shambhala Lineage thangka, this wise gentleman knew all too well what he was getting himself involved in! [Laughter] It has been a wonderful journey, working with this artist. As it is with any artist, we had many discussions, let’s say. [Laughter] It has been a step-by-step process. 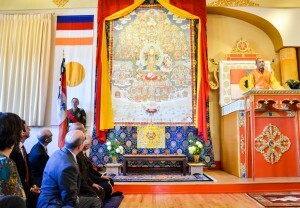 The thangka has the unique quality of the principle of Ashe and the lineage of the Rigdens—both the Rigden kings and the Rigden queens. It has the warrior tradition of Gesar of Mukpo Dong, the warm-heartedness of the bodhisattva principle, divine and powerful meditative deities and protectors, as well as the Kingdom of Shambhala and all the members of the community who are respecting this tradition. As you will see, this image is held in a tree, which is known as the tree of life. It’s the notion of nature, connecting with the earth, and at the same time, it is going to heaven. It represents each of us connecting in that way. Please take this into your heart. As we welcome this thangka and lineage—as we join past, present and future—please join me with good-heartedness and a profound sense of fortunateness and auspiciousness. Wendy Friedman: This time, it’s my delight to introduce a Shambhala Day message from the Sakyong Wangmo, Dechen Chöying Sangmo, Khandro Tseyang, and also from Jetsun Drukmo. The Sakyong Wangmo: Happy Losar and Cheerful Shambhala Day to everyone. I am sending you many tashi deleks and best wishes for Shambhala Day. It is a very special year because we are opening the lineage thangka. The Sakyong has worked so hard to establish this lineage and vision, and now it is really coming into fruition. One of the main messages that inspires me is how we create enlightened society through how we live our lives and through household. In this way, Shambhala is about how we take our practice and manifest by how we relate to others as family and friends, and how we relate to the world. This year, the Sakyong is emphasizing culture, auspiciously beginning on Shambhala Day with how we connect to our basic goodness. So I encourage you all to enjoy and celebrate today, and create wakeful culture. Again, Cheerful Shambhala Day from Nepal where I am celebrating with my family. KI KI SO SO! And here’s a message from Jetsun Drukmo. Jetsun Drukmo: Cheerful Shambhala Day, everybody. I hope you are having fun. KI KI SO SO! Announcer: At this time, with the theme of Shambhala Lineage and how it manifests in the world today, it’s so auspicious that we are all able to be here to witness the unveiling of the Shambhala Lineage thangka, which is the culmination of many years of dedicated aspiration and work on the part of our Sakyong and others who have supported him in this effort. To further consecrate the Shambhala Lineage thangka, we will begin with a short blessing ceremony performed by the Sakyong and assisted by Lama Pejal. Kalapa Acharya Adam Lobel: Sakyong Mipham Rinpoche, Ladies and Gentlemen, what we see unveiled before us is nothing less than a masterpiece of sacred art. It represents the unhesitant and complete proclamation of the Shambhala lineage. This is a historic, momentous event and proclamation. As the Sakyong described, the Shambhala Lineage thangka was painted over the course of a long and patient ten-year process by Noedup Rongae, one of the great living masters, perhaps the greatest living master, thangka painter, with this longstanding connection with the Sakyongs and the Mukpo family. In order to create this masterpiece, Noedup gathered an entire community of thangka painters and had to create a special drum large enough to hold the canvas. Usually thangkas of this size and scope would be painted as a wall fresco, but here we have the traditional format on a canvas, which is very precious indeed. If you look carefully, each figure is alive and breathing. It is somewhat like the moving paintings in Hogwarts. [Laughter] Every eye, every gesture, every silken piece of fabric is vivid and painted with incredible meticulous detail. In a world of speed and rush, this thangka was slow and steady. When the painting was completed, Mr. Rongae presented this thangka to the Sakyong in Nepal, in Pharping, just this year. As he presented it, he began to weep and cry. He rested his head almost on the Sakyong’s lap, and proclaimed this to be his personal masterpiece and the work of his entire life. It is a piece of sacred artwork in terms of the imagery and content, but also in terms of the process through which it was created, and of course that process began long before the actual painting. It goes all the way back to the very origins of time, to the timeless and primordial existence of the Shambhala lineage. That lineage began to emerge in this particular form through the visions and writings of the Vidyadhara, the Druk Sakyong Chögyam Trungpa Rinpoche, who as a young person in Tibet had visions of Shambhala and carried that inspiration with him into the modern world. In turn, Sakyong Mipham Rinpoche has continued that lineage of transmission, unfolding the vision of Shambhala before our very eyes. This particular image that we see before us arose in the Sakyong’s mind very early in the morning—dawn to be exact—in 2004. The Sakyong sat up in bed and called Mr. David Brown to his bedroom, and over the course of a single day, he dictated an immaculate piece of spiritual poetry—the preliminary practices of the Primordial Rigden. 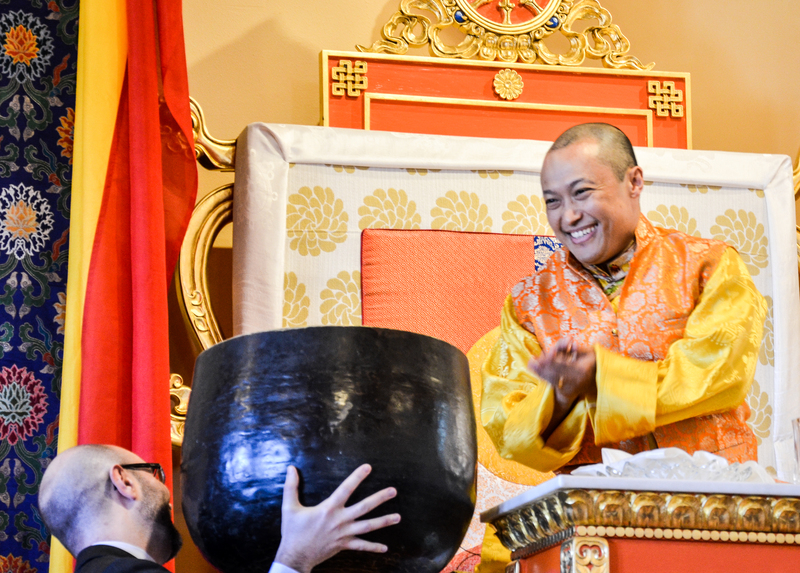 In essence, we have a huge mirror reflecting back to us our life, our commitment to creating enlightened society, our loyalty to this Shambhala lineage, and our delight and magic. When we are afraid, we can turn to this mirror to experience fearlessness. When we have doubt, we can turn to this mirror to see our own nature. When we are overwhelmed by injustice, climate change, and corruption, we can turn to this mirror to see the infinite possibilities of humanity. Editor’s Note: photos accompanying this story are courtesy of Katie Day Weisberger.